People with an active imagination are often more open and welcoming to the energy being sent out by the Universe — and as such, are thus equipped with a powerful tool to creating positive transformations in their lives. Perhaps you aren’t exactly gifted with a penchant for seeing beyond black and white — interpreting things to mean something other than what is directly presented to you — but that doesn’t mean that you cannot experience the benefits that focused imagination can bring. One thing you can do is to give guided imagery meditation a try. Guided imagery meditation is a technique that makes use of all of your senses — sight, hearing, taste, touch and smell — as well as your emotions to achieve a meditative state that can create a positive impact on your life. It’s more than just, for example, picturing a lush green meadow in your mind. While fixing the image in your mind is already an exercise of imagination, the experience can be entirely different if you let your other senses come into play. You could imagine what it’s like to walk through such a meadow; think about how the wind gently stirring the tall grasses feels on your skin, what the wildflowers smell like, what the birds flying overhead sound like, what chewing a blade of grass tastes like, and how the lazy sunny afternoon makes you feel relaxed. Practiced correctly, guided imagery meditation has been found to do wonders to a person’s physical, psychological and emotional health and well-being. Making use of this type of meditation, even for just a few minutes, has been observed by researchers to create a vast improvement on one’s physical condition. It can, for instance, help lower blood pressure, glucose and cholesterol levels. A person’s immune cell activity can be strengthened (the effect can be short-term, but it can still yield positive improvements to overall health). People have reported experiencing less pain and headaches, or being more motivated to lose excess weight. In some studies, it also helped reduce the negative effects of aggressive medical procedures like chemotherapy (such as fatigue, nausea and soreness). Learning to properly focus thoughts and tapping the different senses to create and shape helpful imagery can also give people the tools to improve their emotions and the way they experience life. The meditation can help reduce anxiety and depression, as well as heighten emotions (and present laughter as a very nice thing to indulge in). People find themselves becoming more attuned to music and sounds, they empathize better with people and situations surrounding them, they pay greater attention to instinct and intuition, and they become more open to abstract concepts. 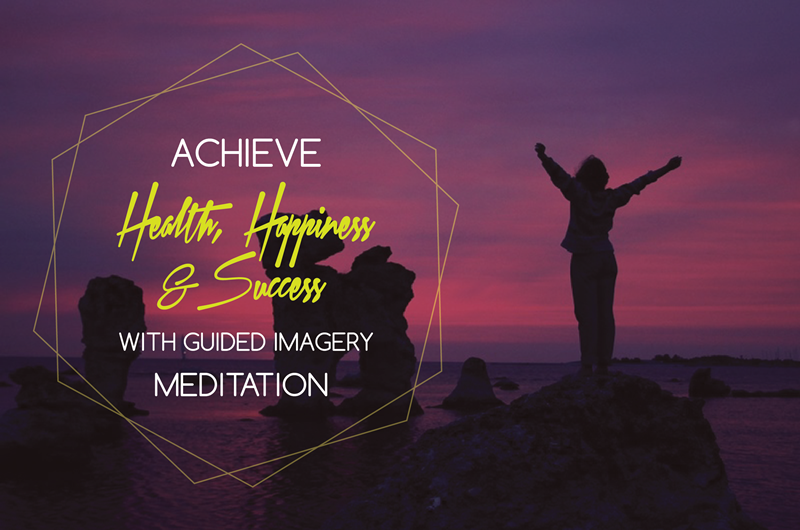 Because guided imagery meditation enables people to direct their senses and thoughts toward a particular concept, they find themselves with the ability to move and work toward specific goals and end results. It helps them become more determined and focused to take each step that will take them closer to a desired end. This, of course, can be applied to work, personal improvements, relationships, aspirations, and other concepts where motivation and dedication play key roles. Thanks to guided imagery meditation, you can discover how to focus, pay attention to details, stay on a set path (or become open and accepting to changes), become sensitive to your body’s and mind’s needs, and take better control of your thoughts, choices and actions. All these lead to a positive transformation in your life.